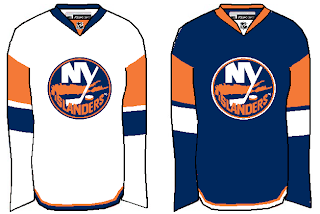 I got a couple of nice New York Islanders concepts delivered to me. I felt like sharing them tonight. The first is a really simple improvement over the new design introduced this year. It's not much, but it makes the sleeves seem like they're actually a part of the jersey. And it does away with the pointless piping around the shoulders. Now if you just can't live without the piping, here's how you do it the right way. Tip: Use a different color for the shoulders. 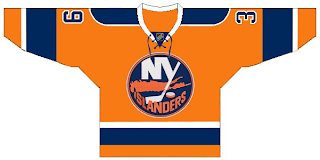 Plus, I've always liked the Islanders in an orange jersey. Just like I preferred the Stars in green — even the Wild in green as well. It's almost like there was actually a mandate requiring teams to wear black, blue or red (the Sharks with the teal the only exception). 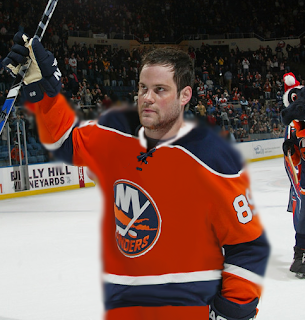 Anyway, here's to orange jerseys and Mike Comrie. Though he appears to be disintegrating as if in one of those sci-fi films. I'll have more stuff to post tomorrow. I hope to make a large-scale update to the Concepts Gallery as well.